When Avice Stephenson settled into her room at the Golden Eagle View she’d been living with an Alzheimer’s diagnosis for more than five years. “Looking after her health-wise was becoming impossible,” said her husband, Gerry Stephenson, now 85. At first he could care for her on his own. Eventually, he’d have help come to their house. Yet, in her last months at home, getting Avice ready and into bed was becoming too physically demanding for Gerry. “It reached a point at least once or twice a week I would finish up on the floor…because I just couldn’t take her weight,” he said. Getting a room for Avice in the Golden Eagle View was important not just for her well-being and safety, but for his own. The long-term care facility, which has 23 beds, is now a few decades old and needs upgrades: to keep up with health and safety; to create a Dementia-friendly environment; and to improve the experience of living in and visiting Golden Eagle View. “I suggested…building a sunroom, because I noticed that when the weather was sunny, even in winter, wheelchairs would cluster around the glass door leading to the outside,” said Gerry, who was one of many family members consulted in the planning phase. Other upgrades and additions to the Golden Eagle View wing of the Canmore General Hospital include a new kitchen, an accessible beauty salon and communal areas for residents and visitors. The overall theme, feels like home, includes plans to make-over the long-term care facility so it resembles the home that it is for 23 people living there. This includes furnishings that you wouldn’t find in a hospital. The Golden Eagle View is also looking at the bigger picture, adding an aesthetic that echoes the town of Canmore itself, with street names and a town clock mural in one of the main common areas. When changing the look of the wing, there are some simple ways to make sure all patients, including those with Dementia, have a better experience. The overhaul plans consider research into how people with Dementia experience things like colour and sound. “We look at all these hard surfaces, it’s very hard for a Dementia person to hear all of these things bouncing back at them. So the new one would incorporate softer surfaces, textiles,” said Kim Chalcroft, manager of long-term care at the hospital. The new kitchen and dining area will have “tables that have a lift lip, so if you want to do a craft, my section of the table could actually go up and down,” added Chalcroft. With a price tag of $1.5 million, the Canmore and Area Health Care Foundation has committed to helping with the cost. To do so, the foundation is asking for donations to the hospital’s “area of greatest need” in order to contribute to this large-scale project. “I just think it has to be part of the community,” said Stephenson. With communal spaces that seem more like home than a facility, he’s confident the Golden Eagle View would attract more events and visitors; already, the wing hosts musical guests. “At some point, everybody will have a connection to that unit, whether you end up living there yourself, everyone will know someone who ends up in Golden Eagle View,” said Chalcroft. Both Stephenson and Chalcroft hope the hospital can get the funds it needs to realize this dream. Sadly, Avice passed away late July. She was 85 years old and is survived by her husband of 62 years, Gerry, and their daughter Dr. Glennis Byron. Kim Chalcroft, manager of long-term care, stands in the Golden Eagle View dining room in the Canmore General Hospital. The room offers residents beautiful mountain views, but the CAHCF hopes to fund an overhaul of the long-term care facility that will include improvements to the kitchen and dining area. 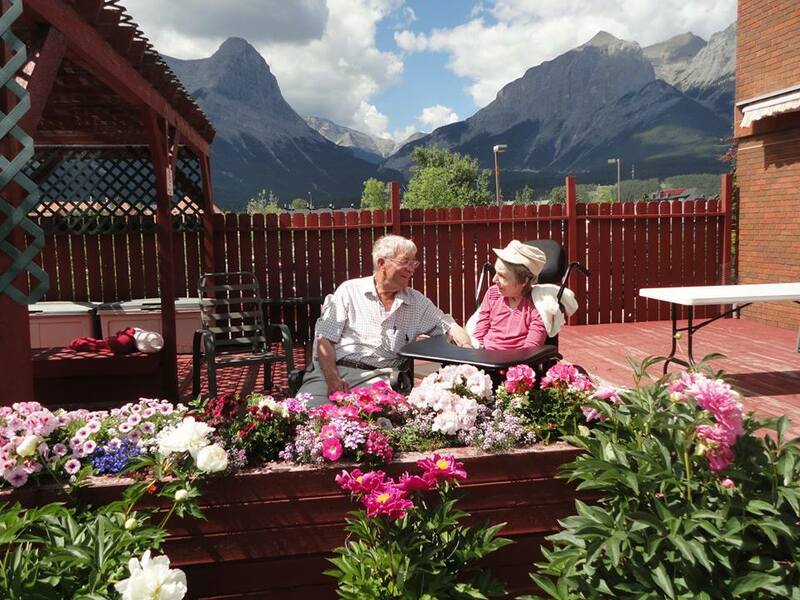 The Golden Eagle View was opened in June 1983 – it was the first long-term care residential facility in the Bow Valley. Today, the facility houses 23 residents and has 35 dedicated staff. The average length of stay in the unit is 950 days. The facility needs major improvements. The capital project will come in around $1.5 million, which the Foundation has committed in supporting. The renovation plans were drawn up by consulting families, residents of Golden Eagle View, and staff at the Canmore General Hospital. The Golden Eagle View enhancement project, ‘Feels Like Home,’ will incorporate design and esthetics with research-based recommendations for Dementia and Elder Care facilities. The vision of the project is to create an environment that ‘feels like home’ for our residents, and will enrich the quality of life of our residents today and for the next 30 years. In its current state, the unit is very institutional in its appearance and décor, and the goal of the project will be to incorporate research-based renovations; some examples of the changes include: updating the lighting levels for various locations, the use of color combinations that elderly and dementia care population are attracted to and thrive in, and even changing the appearance of the unit to more of a ’Home’ environment complete with themed hallways and personalized doorways to each resident room. The project is broken up into 5 components: The dining room/Beauty Salon, the Resident rooms, the Resident common use and living spaces, the unit entrance and nurses desk, and the brand-new addition of a large solarium off the north side of the department. The solarium will provide the opportunity for our residents to enjoy the wonderful surroundings of the Rocky Mountains year-round, and afford another area on the unit for activities and social events. 225 residents have called GEV home since May 26, 1999.